You know how you know you’re old? You willingly spend Saturday afternoons willingly doing DIY projects and enjoying every second of it. I spent this past 4th of July weekend on a roadtrip to Portland Maine. One bar ended up spending a lot of time in, in Portland’s Old Town district, was Oasis. Now if you visit the website, it’s touted as a nightclub (and I guess there was a dance floor upstairs), but the reason we liked this place was that it was primarily outdoors and came equipped with some “life size” version of classic games. There was giant connect fours on the wall, beer pong with kick balls and buckets and several life size jenga games. Not to brag, but I pretty much owned all three, and came home wanting to have my own versions. Now, the connect four is undoable unless you have giant wall space just kind of hanging free. The life size beer pong is easy. You just need to purchase buckets. 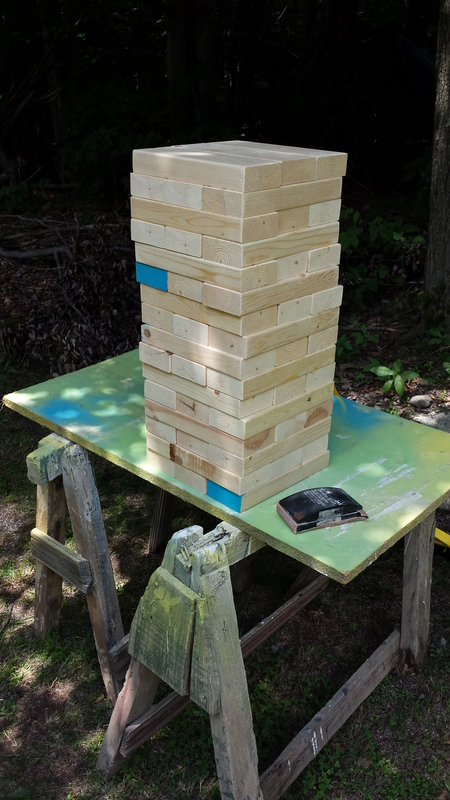 I looked into purchasing a giant jenga as well, but all of the ones I found online (hilariously marketed as “The Giant Tumbling Tower” retailed for $100.00 at the cheapest (colored versions can run you anywhere up to $180.00 plus shipping and handling, natch). I figured it was easy enough to make on my own. All it really is, is cutting boards, and I know friends who’ve done it. I looked up several tutorials online (this is the one whose measurements I ended up going with). Really, though, a whole tutorial wasn’t necessary (unless you want to paint or stain it, which we didn’t do so that the pieces didn’t stick). The whole thing cost me $18.00. I purchased 6 2x4x8 pieces of wood (make sure they aren’t cracked). The next step was just cutting them into 10.5 inch pieces (you’ll need 48 altogether, for 16 rows of three). All I did afterwards was sand the edges to make sure everything was smooth. My dad and I did this on a Saturday afternoon and it took us less then an hour. Really, this is easy for anyone, as long as you have a roommate/father with a nice cache of tools. Otherwise, most lumber stores will cut the pieces for you. 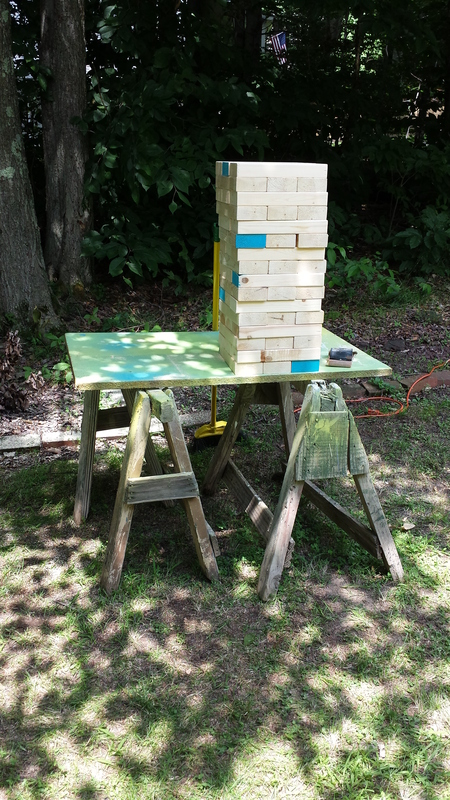 You could always paint the blocks (we opted to go for a more rustic, i.e. lazy look), but if you opt for that I’d recommend sticking to the ends only. I might make another set and do it up red, white, and blue-you could never have enough patriotic gear lying around. I might also do a white trash version where every block has a hidden drinking dare on it. Who knows? I do know that I’ve now convinced myself that I’m crafty and have a few other projects on the horizon. Namely, bean bag boards (which I’ve made before, but never wrote about) and a home-made shot ski.